NATIONAL HARBOR, MD (KTRK) -- In a candid evening interview, former Texas Governor Rick Perry told Eyewitness News Anchor Tom Abrahams he is looking forward to reintroducing himself to the conservative voters he'll address Friday morning at CPAC, the Conservative Politcal Action Conference at National Harbor, Maryland. "These are conservative Republican voters by and large," he said, standing on the press riser at the back of the enormous Potomac Ballroom in the Gaylord National Hotel and Convention Center. "So we need to remind people what we've done in the state of Texas, we need to remind people about the great economic climate that's ben created in the state of Texas." 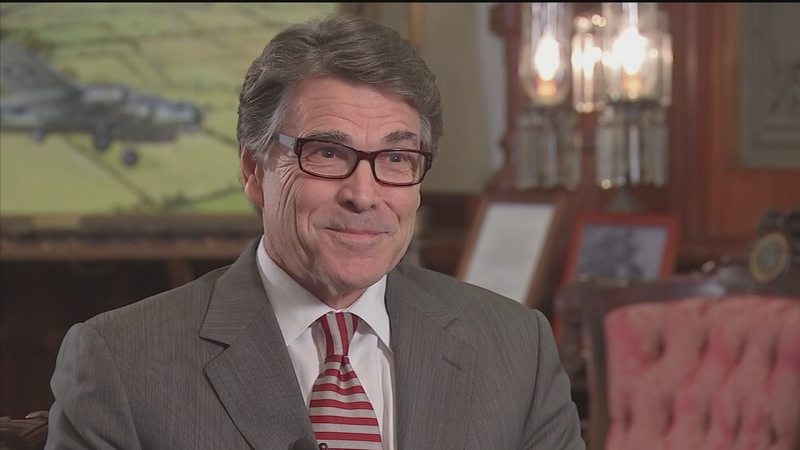 Perry, who will deliver his remarks within ninety minutes of the expected birth of his second grandchild, a girl, says he wants to deliver a message that resonates and offers optimism looking forward to 2016. "The world's pessimistic right now," he said, referring to both ISIS and Russia's aggression in Ukraine. "America's is pessimistic about the leadership ot the lack thereof in the current administration. Giving them a clear pathway to a better future, economically and foreign policy wise is a winning message here." Perry says the world has changed significantly in the year since he last spoke to the CPAC crowd. He is also hoping to draw vocal support from the activists here as he presses toward a second run at the White House, after a bid that stalled in South Carolina in 2012. He's sharing the CPAC limelight with a host of other legitimate contenders of current and former office holders; Kentucky Senator Rand Paul, Texas Senator Ted Cruz, Wisconsin Governor Scott Walker, New Jersey Governor Chris Christie, Florida Senator Marco Rubio, and former Florida Governor Jeb Bush. None has officially announced a candidacy, but all of them talk as if they're headed toward joining what could be a crowded field.